I had went to Port Washington, Wisconsin's Maritime Heritage Festival, and took a self-guided tour of the Tall Ship Peacemaker. I figured I would post pictures of my tour to provide inspiration for more realistic MOCs that we construct. 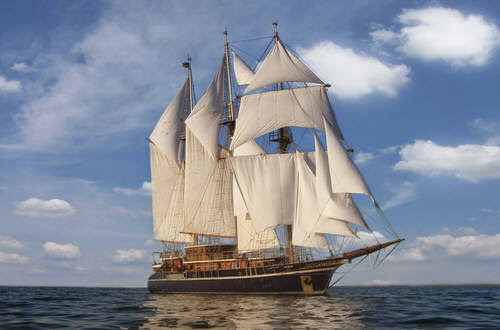 The vessel is a Barquentine Rigged vessel, and its interior construction is apparently based upon the Cutty Shark. Below are specifications of this vessel provided by the website for this vessel. Some images of the lower quarter deck. My three year old was with me with her stuffed parrot, which she thought was a good idea to bring to a pirate ship. Here are some images of the upper quarter deck. In the last thumbnail just above, my daughter was heading to the captain's quarters. It's accessed from the lower quarter deck and is located at the stern. It contains all modern furnishings. Here are some pictures of the bow. And here's a close up of the bell. It's located on the fore/main mast. Well sums up my tour of the vessel, and none of you have to pay $6 per person for admittance. Welcome back, Phred. Thanks for the tour. Thank you Phred, your sacrifice is definitely our gain, it must have been horrible for you to pay all that money to explore a ship that is obviously of no relevance to us! My three year old was with me with her stuffed parrot, which she thought was a good idea to bring to a pirate ship. You have trained her well - but exactly where were the pirates? I strive to be as realistic as possible in my Lego models (when I build Lego models ), so looking at historical sailing vessels like these help me to build more accurate ships. Apparently in her mind, every sailing ship is a pirate ship. Don't worry, the lashes will continue until she understands otherwise.